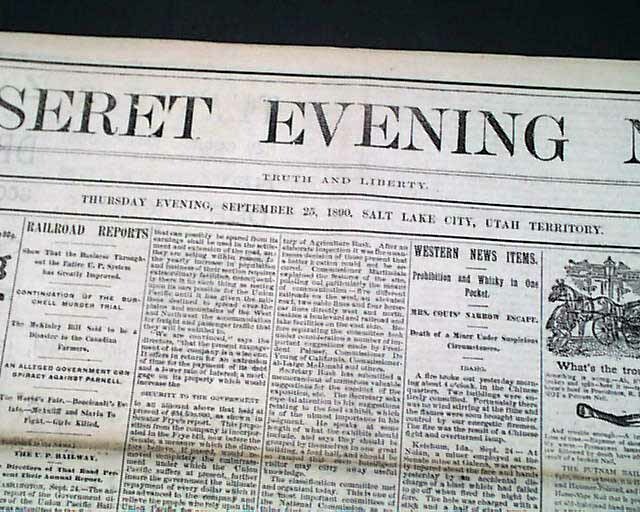 DESERET EVENING NEWS, Salt Lake City, Utah, September 25, 1890 This newspaper contains one of the more noteworthy events in Mormon history, that being the printing of the "1890 Manifesto", a statement which officially ceased the practice of plural marriage in The Church of Jesus Christ of Latter-day Saints. Signed by church president Wilford Woodruff in September, 1890, the Manifesto was a dramatic turning point in the history of the Mormons. The Manifesto prohibited church members from entering into any marriage prohibited by the law of the land, but did not require the dissolution of existing plural marriages. 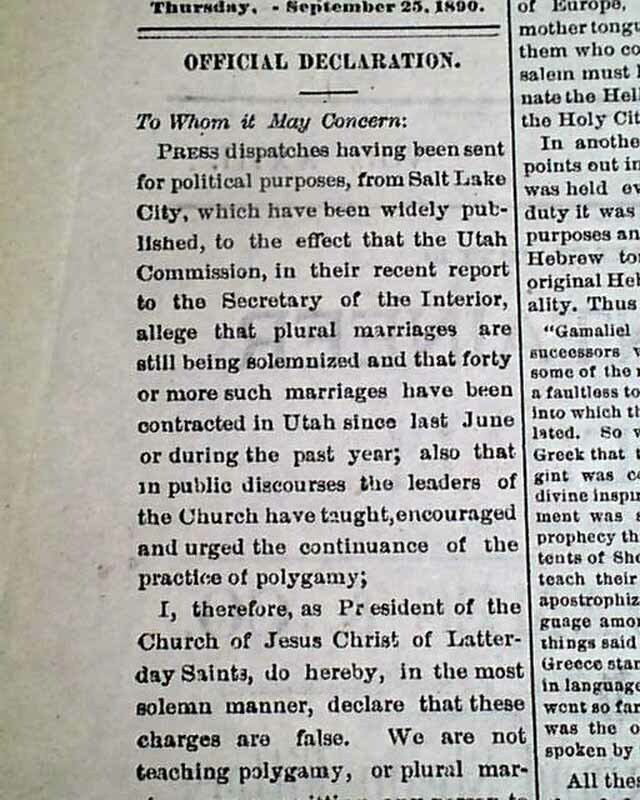 The United States government had been exerting much pressure on the Mormons to dissolve their polygamy practices and in April of 1889 the church president privately began refusing permission for plural marriages. 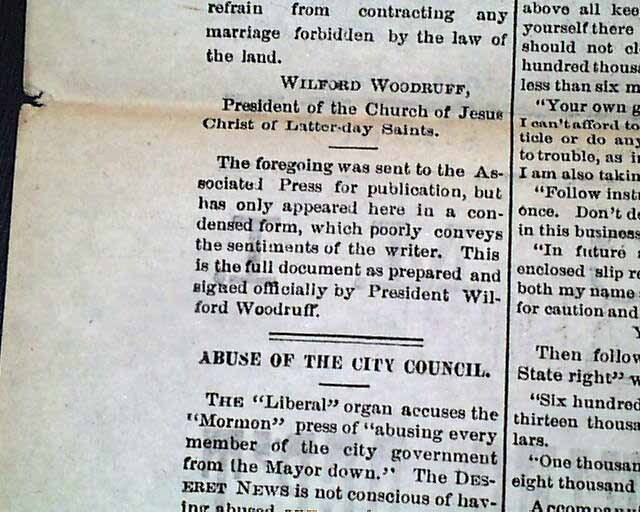 As reported on the web, Woodruff would later recount that on the night of September 23, 1890 he received a revelation from Jesus Christ that the church should cease the practice of polygamy and he announced the Manifesto on September 25 by publishing it in the church-owned "Deseret News" newspaper. This is that newspaper. 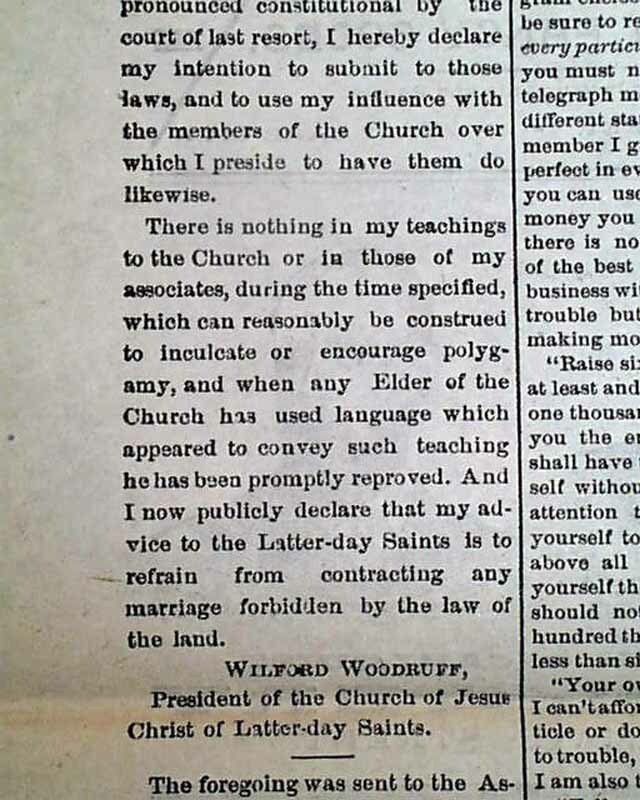 The full text of the Manifesto, headed: "Official Declaration", datelined September 25, and signed in type: "Wilford Woodruff, President of the Church of Jesus Christ of Latter-day Saints", appears in the first column of page 2 of this issue (see photos). Portions include: "...We are not teaching polygamy or plural marriage, nor permitting other number of plural marriages have during that period been solemnized in our Temples...Inasmuch as laws have been enacted by Congress forbidding plural marriages...I hereby declare my intention to submit to those laws, to use my influence with the members of the Church over which I preside to have them do likewise...And I now publicly declare that my advice to the Latter-day Saints is to refrain from contracting any marriage forbidden by the law of the land." 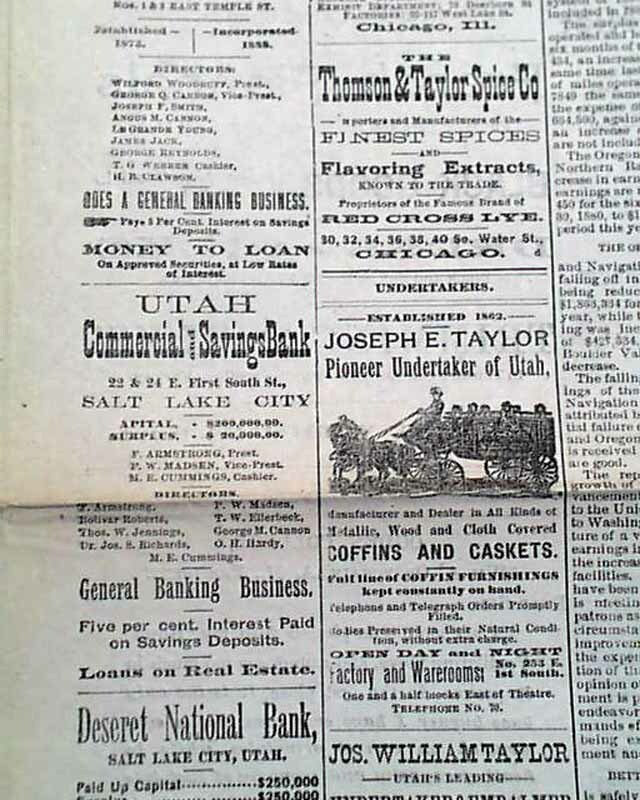 This Manifesto would help pave the way for Utah statehood, which would come in 1896. It should be noted, as shown in the photo, that the printing of this document is concluded with a statement reading: "The foregoing was sent to the Associated Press for publication, but has only appeared here in a condensed form, which poorly conveys the sentiments of the writer. This is the full document as prepared and signed officially by President Wilford Woodruff." In other words the Manifesto which appeared in other newspapers shortly after this date would not be the full Woodruff text which appears in this newspaper. Indeed, "The World" newspaper from New York City dated Oct. 7 contains an abbreviated version of this letter. 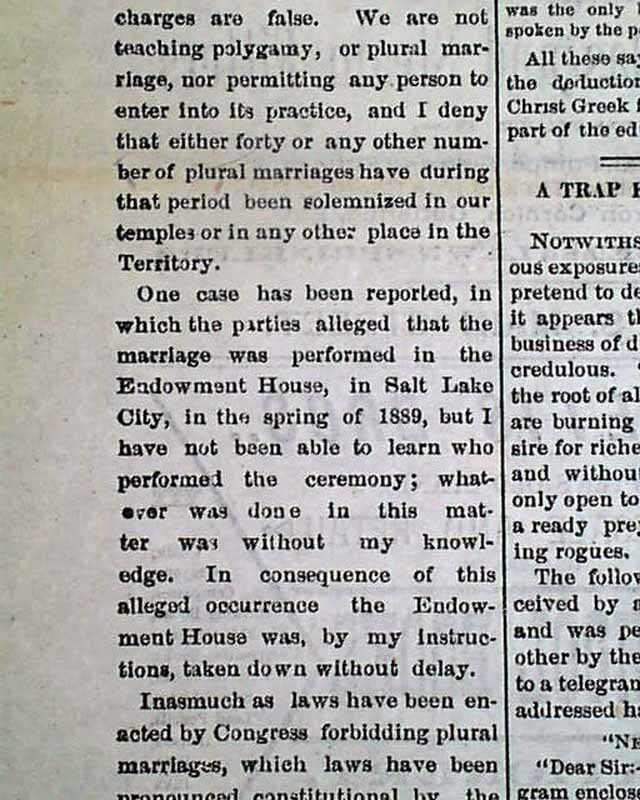 This is an exceedingly significant issue, as it not only contains an extremely early report of this important document by the Church president but it appears in the Mormon-owned newspaper from Salt Lake City. Certainly the earliest report of this text to be had, and exceedingly rare & desirable as such. 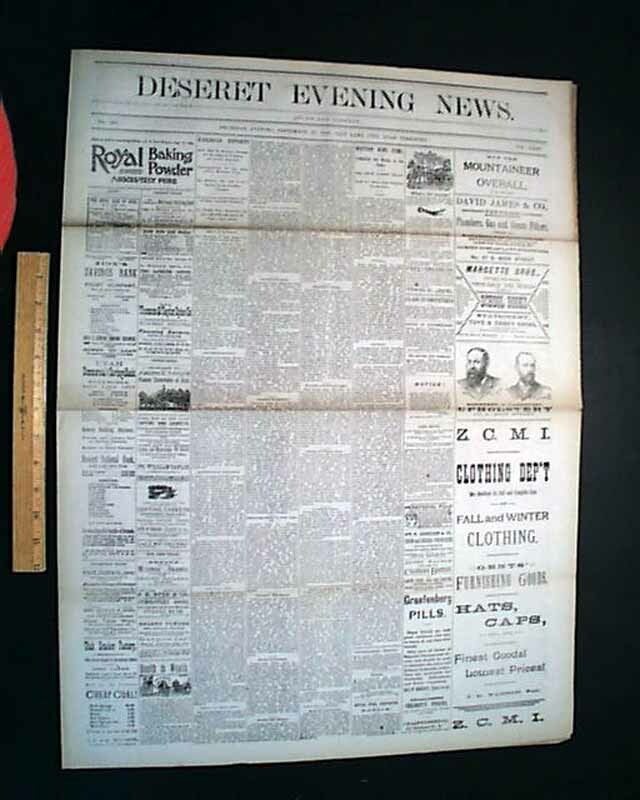 Complete as a 4 page newspaper, never bound nor trimmed, measures 20 3/4 by 28 inches, some browning at the top fold of the ftpg. only, generally in very nice, clean condition.